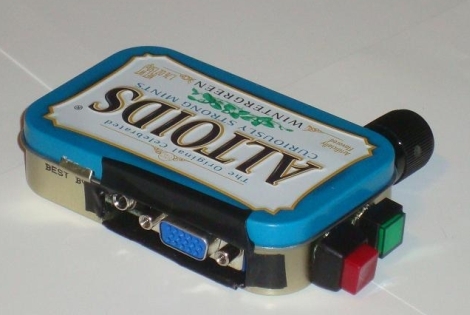 [Chris] recently finished building a miniscule AV Test Box, capable of fitting inside a standard Altoids tin. It is a revision of a project he constructed a few years ago. His previous test box worked well, but was large and cumbersome – definitely not something you would want to carry around from place to place with any frequency. The new test box does everything its predecessor is capable of, which includes displaying an 800×600 VGA test pattern as well as generating sound signals for testing audio systems. He updated the circuit design a bit, employing a newer PIC processor to run the show, otherwise most of the design details have remained the same, form factor aside. His build log is full to the brim with details as usual. You will find thorough descriptions of all the components he used, schematics, source code, as well as the theory behind the build. Be sure to check out the video embedded below of his new AV tester in action.